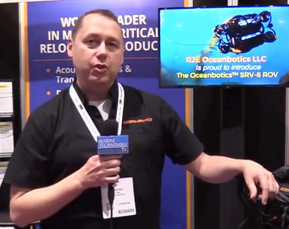 Teledyne Oceanscience has introduced a new remotely operated hydrographic survey boat suited for inland waters such as streams, rivers and lakes. The new trimaran style Z-Boat 1250 is “sturdy enough for tough terrain but light enough to be one person portable,” according to Teledyne. 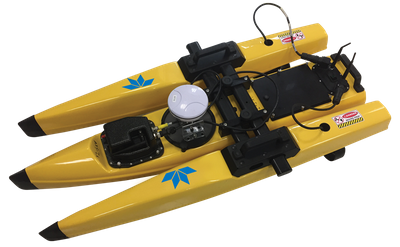 The vehicle has a lightweight hull manufactured from acrylonitrile butadiene styrene (ABS) plastic, and is IP67 rated, which makes it well suited to survey in most water conditions. The vehicle weighs in at less than 50 pounds, including all instrumentation. A collapsible sliding crossbar makes the Z-Boat 1250 easily transported by a single operator. The vehicle’s integrated single beam echosounder has an embedded transceiver with digital signal processing and outputs depth & temperature using NMEA 0183 data output. The “exceptionally rugged” Z-Boat 1250 design features a propulsion system that uses two thrusters (one in each outrigger) and an advanced 2.4 GHz remote control transmitter that differentially adjusts the two thrusters to steer the boat – no rudder or steering linkages. The Z-Boat 1250 can attain a 2.3 m/s (7.5 fps) top speed using the standard battery pack, and the remote control transmitter can be adjusted to allow effective profiling at speeds as low as 30 cm/s (1.0 fps). Applications include mining pits and tailing ponds, environmentally sensitive areas, construction and inspection zones, dams and reservoirs, harbors, rivers and more, Teledyne said. Warranty: One year on all Z-Boat 1250 components.